Fellow 500 Home Run Club® member Ted Williams famously said "They invented the All-Star game for Willie Mays!" But some might contend the honor most befitting “Say Hey” Willie’s inspirational life – during and after his MLB career – is the MLB “Beacon of Life” Award, which will be bestowed upon him on Saturday, May 15 as part of the pre-game festivities surrounding the 2010 Gillette Civil Rights Game in Cincinnati. Civil Rights Game Weekend includes a series of events that pay tribute to men and women who championed equal rights for all Americans, both on and off the field. Along with Mays, women’s sports pioneer Billie Jean King and award-winning entertainer and activist Harry Belafonte will be honored at the MLB Beacon Awards Luncheon, prior to the game between host Cincinnati Reds and The St. Louis Cardinals (highlights onwww.MLB.com.) Rachel Robinson, widow of Jackie and founder of the Jackie Robinson Foundation, will also be honored at the Luncheon and Hall-of-Famer and beloved “Mr. 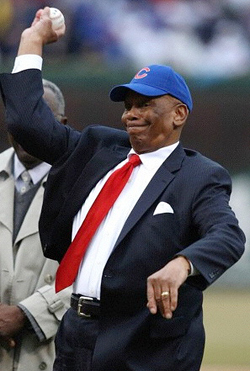 Cub” Ernie Banks will throw out the game’s first pitch. 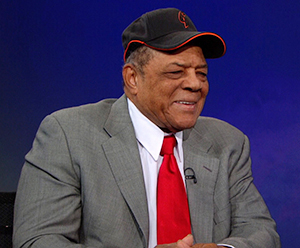 Mays, who together with Monte Irving and Hank Thompson, was part of the first all African-American outfield in Major League history during the '51 season, became the New York Giants' first African American captain in 1964. He went on to compile 3,283 hits, 660 home runs and 24 All-Star appearances - which prompted Williams’ comment seen above. Proceeds from the Beacon Awards Luncheon will benefit the MLB Urban Youth Foundation, the Cincinnati Reds Community Fund and the National Underground Railroad Freedom Center. For more information, visit www.MLB.com/civilrightsgame.